A great centerpiece is the, well, centerpiece of a well decorated table and a festive home. Whether you're hosting a large family for the holidays or you simply want to add a bit of beauty to your table all season long, there are endless ways to style a centerpiece. We've found the best options for every table and home, whether you have only a few minutes to whip something up or you can devote an afternoon to creating a stunning centerpiece. This showstopping (and delicious) centerpiece from Celebrate Creativity uses dried apples and cinnamon sticks to create an impeccable piece you can use through the entire winter season. These simple-yet-elegant, birch-wrapped candleholders from Digs Digs remind us of a snowy walk in the woods. While real, soft birch is always a great choice, you can also fake this look with felt if you can't get your hands on the real thing. Add a few sprigs of pine or some holly to create more holiday-friendly look. Just because it's cold outside, that doesn't mean you can't bring fresh flowers into your home. This stunning centerpiece from Green Wedding Shoes uses hyacinths, roses and tallow berries set in a vintage silver vase. If it's a little too intricate, you can incorporate the same wintry floral look in a smaller arrangement. Stick to deep reds, whites and greens to keep it cold-weather friendly. This simple candle centerpiece idea requires just four things: a candle, a bottle, some greenery and a bit of water. In just a few minutes you can create a woodsy, verdant look to bring a fresh feel into your home during even winter's harshest days. If you're looking for more ways to add greenery to your home, check out our other favorite ideas. Who doesn't have a handful of mason jars sitting around waiting to be put to use? Here's your chance to do just that by creating your own personalized snow globe using fake snow, a vintage jar and whatever whimsical figurines you can find. This globe uses pine trees for a more Christmas-y vibe, but you can easily replace them with woodland creatures or greenery to keep it fresh after the holidays are over. This floating cranberry centerpiece is festive enough for Christmas, but subtle enough to keep out for weeks afterward. We love Christmas decor that works all winter long, because the coldest dregs of winter could always use a bit of warmth and cheer. We love centerpieces that you can eat, so this adorable cake topper from Say Yes is right up our alley. Ditch the formal centerpiece idea and replace it with a delicious cake - a few sparkly gold pipe cleaners create a quick cake topper to ring in the New Year. Left with a lot of wine bottles after Christmas? This gold glitter centerpiece from Delightful Details is a great way to use them up. Use a bit of spray paint, some glitter and voilà: You've got a centerpiece perfect for any New Year's Eve party. This darling centerpiece from Dagmar's Home utilizes a vintage pie tin as the setting for a wintry wonderland diorama. You can find discount miniatures at any craft store after Christmas - just add a little bit of fake snow. We love pinecones because they're easy to find (and gathering them up is a great for pre-spring cleaning). This classic, farmhouse-y centerpiece requires a large hurricane candleholder, a few pinecones and fake snow or small pebbles to create a look perfect for any late February dinner party. The "sky lodge cabin" aesthetic is a great way to add a wintry vibe to any centerpiece. This stunning look from Apple Brides incorporates antlers (you can find real or faux antlers at most flea markets) to give off a modern, rustic feel. Add a vintage lantern and some greenery, and your table is set for the whole season. Here's another great idea for those leftover wine bottles, with a melted candle centerpiece that feels like your favorite neighborhood restaurant - in a good way. String some greenery around the bottles to give your dining room a romantic, cozy feel. If you get candle wax drippings on your tablecloth, fear not - we have you covered. Cozy white lights are one of our favorite ways to decorate for the holidays, but the look extends far past December 25th. This fun glass hurricane look is great for large dining tables and is incredibly easy to recreate. 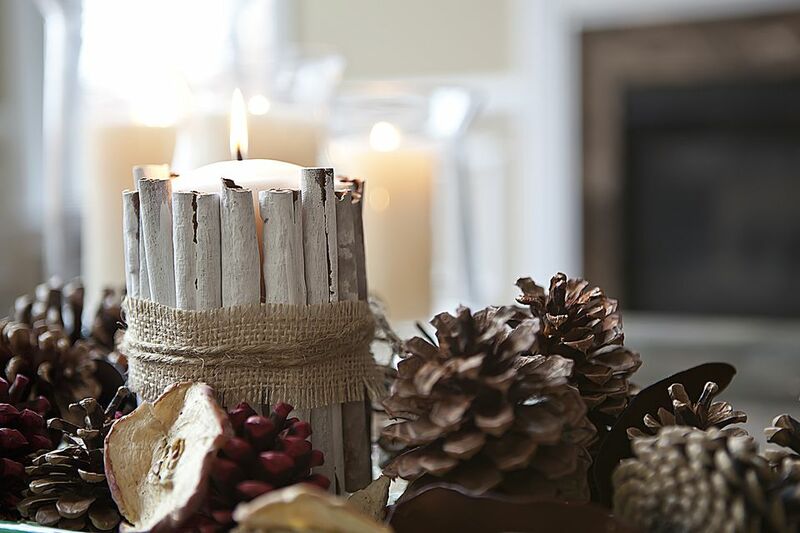 A few pinecones and some battery-powered twinkle lights are all it takes to create this easy, warm centerpiece. Mini Christmas trees are a staple of any grocery store or nursery during the month of December, but this fun centerpiece from The Golden Sycamore proves it's just as charming after the holiday ends. This simple polka-dot pot isn't holiday specific, which makes this Christmas tree look great for every month. You can find mercury votives for cheap at most craft stores, and they're perfect for ringing in the New Year. Naturally glam and chic, they make any flower or candle look festive. Add a few sprigs of baby's breath for your next celebration. If you don't have mercury glass, you can DIY it with a bit of spray paint. We love how blogger Aka Design transformed a vintage toolbox into a chic, beautiful and wintry centerpiece. If you can't find the perfect toolbox, a milk crate or old soda box work just as well, just add a few candles and some greenery. This rustic, modern update on a candelabra is a great way to bring the fall harvest into the winter season. Use a vintage pie or hat box (although any wooden container works) and floral foam to keep candlesticks in place. Decorate with apples, pomegranate or cranberries to give this centerpiece the perfect winter vibe. Who knew a soup can could look so glam? 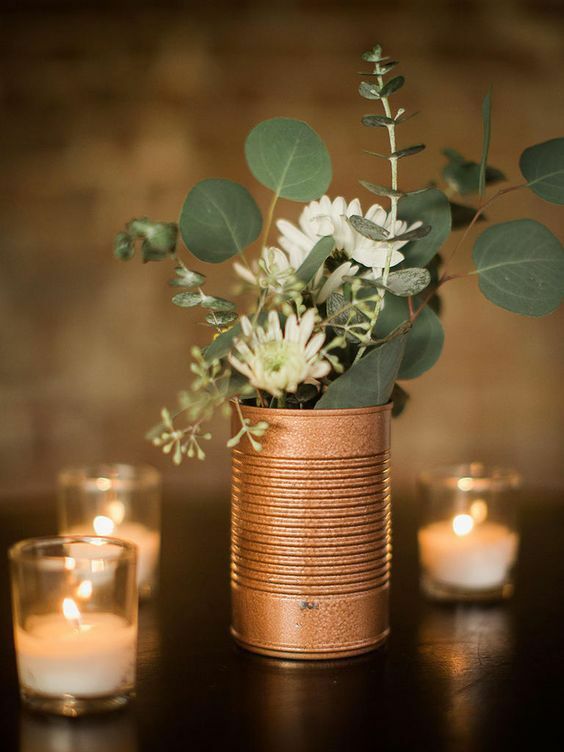 There are many ways to upcycle a tin can, but this chic gold centerpiece is one of our favorites. It's incredibly easy to recreate: Simply spray paint a few old tin cans and add some flowers for a classy look perfect for New Year's and beyond. Need some floral arrangement help? Check out our tips to arrange like a pro. Geometric terrariums are wildly popular right now, and for good reason: they're chic, glam and versatile. Whether you fill them with succulents, candles or twinkle lights, they add an air of sophistication to any home. We love this look for a dinner party or a cozy winter night at home.